What if I have internal Bluetooth and also an external USB Bluetooth? Or two internal Bluetooth devices. Random case you might not have considered: what happens if your primary mouse and/or keyboard connect via bluetooth? Then the bluetooth on/off button can get turned off but not back on. By the way, those toggle-buttons look really odd, and a fairly direct ripoff of iOS (where they also look odd). Please. These toggle buttons are, besides a total ripoff, a usability nightmare. Are these becoming standard in GNOME? For starters, congratulations on your work. It's really great. - The visibility: I think it's better with a string like "Be visible by other devices\nName:name_of_computer" and using a checkbox instead of switch ON/OFF because the visibility is not a feature, it's an option of a feature (Bluetooth is the feature). - The button to go to Mouse and Touchpad settings: "Mouse and Touchpad" is too abstract and it concerns only the mouse. The label of this button should be "Mouse Settings". Other than these two (important) details, this new panel is a really great work. The dialog looks very nice! However, it seems a bit odd to me that there are three toggle buttons visible at the same time. Won't the switching of the options "Active" and "Connection" do the same thing (at least for the user?) or is "Active" meant for the Bluetooth adapter itself? Maybe changing "Active" to "Power" or something like that would clarify things a bit more. The toggle switches are drawing my eyes all over the place. It seems unbalanced. Maybe try moving the 'Visibility' toggle over to the left to line up under the 'Active' one. Have the designers considered and rejected a "make visible for 60 seconds" button? There's a lot of wasted space in the second panel. It looks too empty. The UI looks very good, but you missed the a "Trust" button and the Trusted properties. I'll try to reply to all the comments in order. Anonymous: only the "default" adapter gets a UI, this isn't a change from gnome-bluetooth, which only supported one adapter as well. I'd say that the very large majority of users only have one Bluetooth adapter, and if they have 2, that's because one is "hidden" through lack of specs. For example, one Bluetooth adapter for your headset, and one in HID mode (a Logitech, Dell, or Broadcom dongle) for your keyboard and mouse. Anonymous, abrander: I didn't make the toggle buttons. But they serve a purpose. Looks like the designers didn't write guidelines for usage. Korbé: The settings labels got changed back to follow the mockups. For the visibility problem, best discuss it in a bugzilla. Anonymous: That's pretty much what we aim not to do. Unless you were saying that we're missing features somewhere, like a toggle button to enable integration. nailuj24: I switched it to say "Power" now. It's true that "Active" wasn't very helpful. Leif: If you want to discuss the design, please file bugs, as mentioned to Korbé above. Marius: "Discoverable for 60 seconds" buttons are more annoying than anything else. If we were a "single screen" desktop, we'd make the device visible whenever the Bluetooth screen is opened, like iOS and MeeGo do. Anonymous: There's more stuff to go in there, such as information about the services supported by the device, etc. pao: No, it's not missing. "Trusted" is used for devices that use unencrypted connections, such as mice (except Apple's). The Bluetooth wizard already marks such devices as Trusted when you pair them. So any known device is either paired or trusted. This was removed in gnome-bluetooth already. There seems to be no purpose in using the slider switches. There were introduced by Apple on iPhones to unlock the screen with a finger swipe (while other accidental contact with the screen leaves it locked), and for that purpose it is a clever widget. In a desktop environment, it amounts to little more than a clunky gimmick. 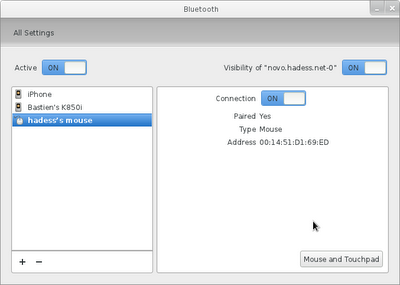 Standard GTK checkboxes and an antenna icon that indicates the Bluetooth radio status would be a better choice. Is there some guideline over the use of these toggle switches, which I've seen in a few blog posts now? I can see that they're mentally different from a checkbox even if technically equivalent, but what logic are you using to decide which one to use? The toggle switches to me imply state - they very clearly show the current value - where a checkbox is merely an optional behaviour. Is that your reasoning too?